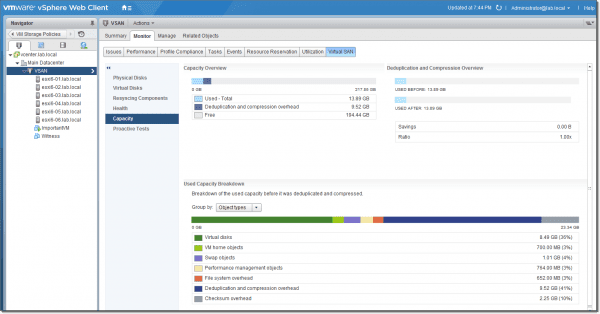 In this article I will show you how to configure RAID 5/6 (erasure coding), deduplication, and compression on VMware vSAN. By activating erasure coding on a VSAN cluster, you’ll be able to spread chunks of the VM’s files to several hosts within the cluster. Note that a Virtual SAN cluster has to consist of at least 4 to 6 hosts. Of course, it may be (much) larger than that. A VSAN cluster is limited by the maximum vSphere cluster size, which is 64 hosts. The Requirements: The hardware and HCL for VSAN requirements are the same as for other configuration types of VSAN: a minimum of 4 hosts for RAID 5 and a minimum of 6 hosts for RAID 6. Make sure that each host has at least one SSD available for the cache tier and one or several SSDs available for the capacity tier. Note that erasure coding is only available for the VSAN All-Flash version. The Configuration Steps: Basically, you’ll need hardware that is capable of running VSAN and a VSAN license. Then only a few configuration steps, including network configuration, are necessary. I assume that you know how to create a Datacenter object and cluster object, how to add hosts to vCenter, and how to move the hosts that will be used for VMware VSAN into the VSAN cluster. 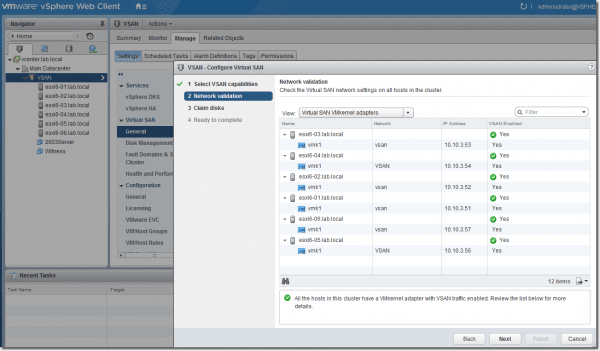 Once you’ve completed these steps, select the VSAN cluster > Manage tab > Virtual SAN > Edit. 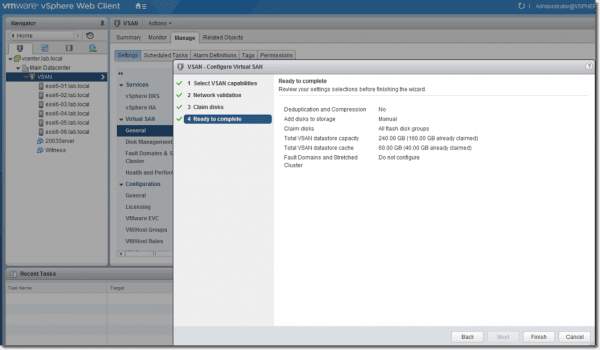 The VSAN configuration assistant will launch. 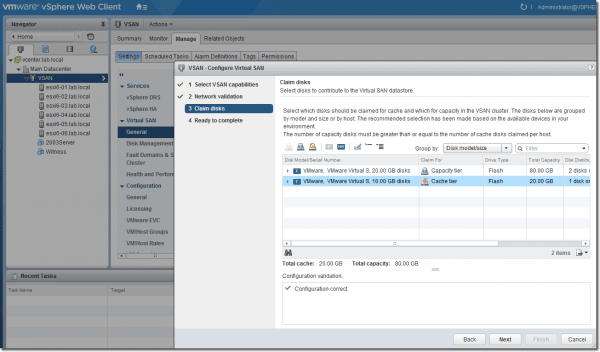 You have the option of controlling how the local disks are claimed for VSAN. If this is done automatically (assuming that all disks are blank and have a similar vendor mark/capacity). Or you can do it manually and control which disks will be part of the cache tier and which will be part of the capacity tier. Then we have the networking requirements. Each host has to have one VMkernel adapter activated for VSAN traffic. Here you can see the disk claim page. This page is same for all versions of VSAN and allows you to tag/un-tag disks as Flash or as HDD. This is for cases in which VSAN does not recognize the hardware automatically. Then we have the overview page. As you can see, I have already claimed my disks for the previous use cases with VSAN, so I only added two new hosts to my cluster in order to show the erasure coding configuration. On the review screen, you can see that 160 Gb were already claimed. Click the Finish button and wait few minutes until the VSAN datastore is created and the system shows you that VSAN is on. As you can see, so far we have just created a VSAN cluster. We now need to create a VM storage policy. An overview of both policies is given below. Remember that failure to tolerate (FTT) refers to how many failures the VSAN cluster can tolerate. The diagram below illustrates the configurations (courtesy of VMware). Then we can start and create the RAID 5 and RAID 6 policies. Connect via vSphere web client and click the VM Storage Policies icon on the Home tab. On the next page, click Create a new VM storage policy. 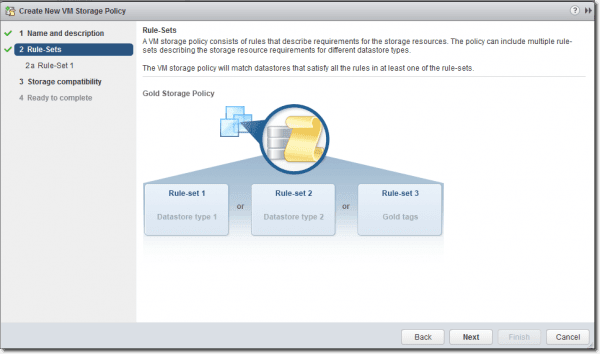 Now you’ll see an overview page explaining what VM storage policy is and what the rules and requirements for the storage resources are. We can now start adding rules. 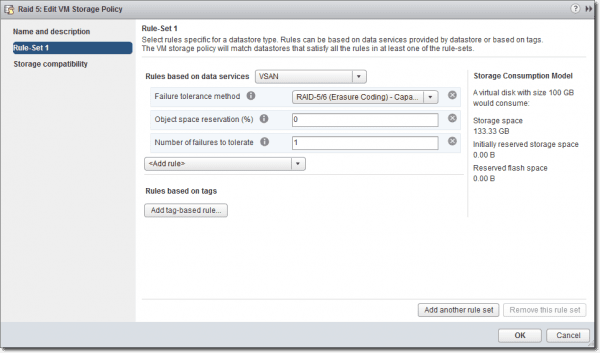 Make sure to select the VSAN from the Rules based on data services drop-down menu. Then choose Failure tolerance method to start with. Next select Raid 5/6 (erasure coding) – Capacity from the drop-down menu. You’ll see an example calculation on the right telling you how much storage space the VM will consume. In our example, for a 100 Gb disk, you’ll consume 133.33 Gb of VSAN storage space. Similarly, you can see that for RAID1 (if you want to test it), you will basically just have a mirror that uses 200 Gb of storage space on the VSAN datastore. Click Finish to validate the rule. The same you would do for RAID 6, follow the same steps but set the number of failures to tolerate to 2. It is not enough to just create a VM storage policy; we also need to apply this policy to our VMs (VMDKs). It’s important to know that you can apply or change a policy on VM(s) that are running—no need to stop them. The VM’s objects get reconfigured and rebalanced across the cluster automatically and in real time. By default, there is a “Virtual SAN Default Storage Policy” only, which utilizes RAID 1. 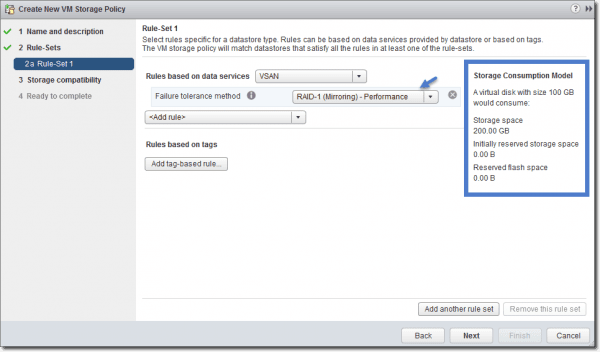 Once you create your own RAID 5 and RAID 6 policies, you can apply this policy to existing VMs or use this policy for VMs that you migrate to your new VSAN datastore. 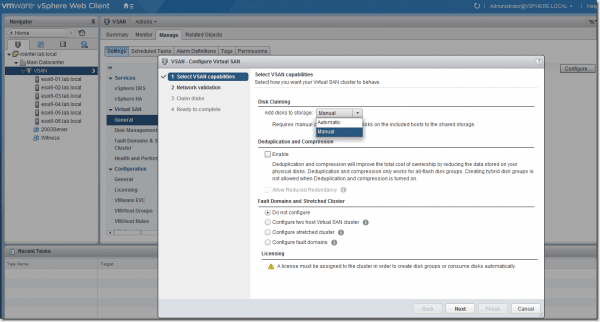 After you create or migrate VMs to your VSAN datastore, go to Select your VM > Policies tab > Edit VM Storage Policies button. Then select the RAID 5 or RAID 6 policy from the drop-down menu > hit the Apply to All button > click OK.
Then verify that your VM’s compliance status is Compliant. You can see that our RAID 5 VM storage policy is applied to this VM. The last things to activate are deduplication and compression. The VSAN All-Flash version uses these features to reduce storage space in addition to the space savings present with RAID 5/RAID 6 compared to RAID 1. We can also verify how the virtual disks are placed on our VSAN cluster. As you can see, the components are spread out through all 6 hosts. With RAID 5, there will be 3 data components and a parity component; with RAID 6, there will be 4 data components and 2 parity components. As you can see, VMware VSAN is a software-only solution tightly integrated into the VMware stack. It’s a kernel module, so there is no need to install any virtual appliance to create shared storage. By only using local disks and SSDs, you can create a shared VSAN datastore visible to all hosts within a VSAN cluster with just a few clicks. VSAN scales in a linear manner, which means that by adding more hosts to the cluster, you grow not only storage but also CPU and memory, making it a truly hyper-converged infrastructure.